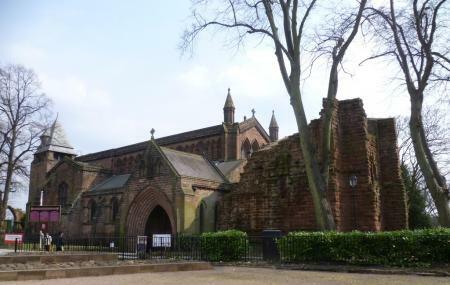 Find hotel near St. John The Baptists Chu ..
St. John the Baptist's Church, Chester, is one of the most beautiful churches in the whole region and is known well among tourists for its chic architecture. The church is an active Anglican parish church in the diocese of Chester and has become a National Heritage site in the city. The interiors of the church are made up of Norman material and have Early English architecture on its exteriors. So visit the holy destination and indulge in a journey of spirituality and history. Timings can be known locally or by. Buses from Pepper Street (Stand Z) can be taken. How popular is St. John The Baptists Church? People normally club together Chester Cathedral and Chester Canal while planning their visit to St. John The Baptists Church. A Norman church built on the site of a Saxon minster, though its origins may go back much further. Atmospheric sandstone ruins with Norman and Gothic arches, and lots of friendly squirrels. Don't miss the eerie medieval coffin set high up in a wall. I found the church itself very welcoming, the atmosphere is deeply spiritual and there's so much to see! Of particular interest to me were the beautiful stained glass window depicting events from the church's history, and the medieval fresco on one of the massive pillars. The ancient effigies were fascinating too. There's a little café and a gift shop, and toilets in the entrance. The two ladies who served me were really pleasant and friendly. A beautiful and peaceful place, well worth visiting. Worth a visit loads of windows to look at and other bits if your interested and cameras are also allowed in here.